Keith Thompson’s eyes light up when he starts talking about his Master’s degree from Western Michigan University. After a comprehensive tour of the WWMT Channel 3 News offices and studios, Keith and I sat down to talk about his experiences in graduate school. Keith earned his Master of Arts degree in Communication from Western Michigan University in April 2013, and he has high praise for WMU, The School of Communication, and the Graduate College. While working part-time on his degree, Keith continued to work full time as the chief meteorologist for WWMT, a position he has held since 1995. 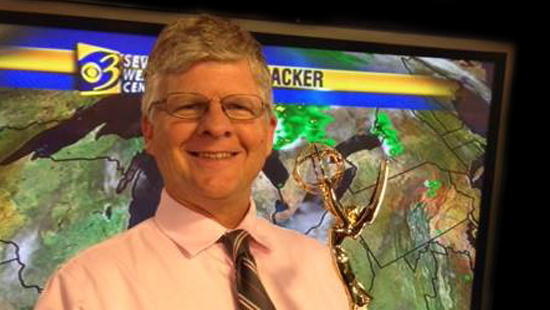 He won an Emmy award for best television weathercaster in Michigan for a weathercast focusing on an intense winter storm that came through in February 2013. His Facebook page lists him as a “News Personality” who is “liked” by thousands of people, and he does have a larger than life personality, so perhaps that title is most fitting. Keith displays a caring, calm demeanor that puts viewers (and interviewers) at ease. For background, it is important to know that Keith grew up in Jacksonville, Florida. His life was shaped by the influence a large body of water has on a geographical area, just as West Michigan’s climate is shaped by conditions on Lake Michigan. For his bachelor’s degree Keith went to college at Harding University in Arkansas. He started his broadcast career in Gainesville, Florida at WCJB-TV and joined the NEWSCHANNEL 3 team in 1989. In 2001 he received the American Meteorological Society Seal of Approval. In 2005 he considered the idea of going back to school and received much encouragement from then director of the School of Communication, Dr. Steven Rhodes. It took him several years to finish due to demands of his work and growing family, but even attending classes part-time, he managed to become a scholar whose groundbreaking work gained him a respected place in his department and at professional conferences. His first classroom experience was with Dr. Mark Orbe, who taught Introduction to Research Methods. The rigorous instruction and attention to detail, according to Keith, “set the bar as high as it could go.” He noticed right away that faculty and advisors had high expectations, and he rose to the occasion. He was inspired by the culture of learning and the way that graduate students were treated as peers. Several faculty in the School of Communication were especially helpful and inspiring to him, including Dr. Orbe, Dr. Sandra Borden, and Dr. Leigh Ford, as well as Dr. Autumn Edwards and Dr. Jennifer Macciorlatti. Dr. Michael Pritchard from the Department of Philosophy was also on his thesis committee. They encouraged him to present his original research at conferences, and he gave successful presentations at annual meetings of the National Communication Association and the Association for Practical and Professional Ethics. Keith’s area of specialization is philosophical in nature, with special focus on the dilemma faced by television meteorologists who, as part of a news organization, are bound by a journalist’s ethical obligation to objective, no-opinion reporting, but as scientists, may feel compelled to express an opinion based on expertise. In his thesis, Keith used the highly-politicized topic of climate change to analyze the ethical dilemma, applying the “weighted duties” reasoning of philosopher W. D. Ross to conflicts a weathercaster may encounter. For instance, Ross’ prima facie duty of fidelity — manifested by keeping the implied promise of objectivity — is measured against other duties which may be fulfilled by the offering of an expert opinion. The thesis laid out several scenarios wherein a weathercaster might be inclined to express his/her opinions, including in a book, a blog, and a newscast. Keith used Ross’ “weighted duties” approach to analyze each scenario for its adherence to the prima facie duties. Among his conclusions: weathercasters may not be justified in expressing an expert opinion in a newscast, but may find justification in doing so using another vehicle such as a web blog or authored book.